This project refers to a Security Alarm System implemented with Arduino and various electronics. 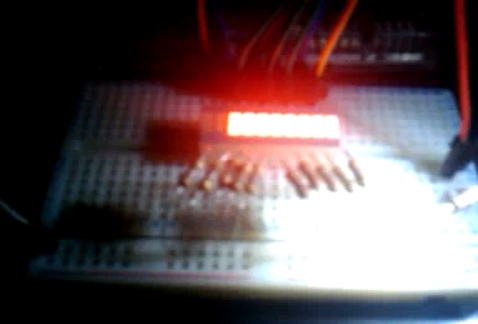 Arduino: Light Indicator with multi-LED bar graph and light sensor. This project refers to an Arduino sketch that implements a light indicator with the help of an external sensor (photoresistor) for the recognition of light, and a bar graph of many LEDs used as a rating indicator. Furthermore, if the indicator reaches the last rating which indicates that there is “perfect” light (the maximum light that the sensor can identify) then it plays a melody with a piezo speaker located in the system. Arduino: Alarm clock with light sensor and ON / OFF buttons. This project refers to an Arduino sketch that implements a simple alarm clock using a light sensor, a piezo speaker, two buttons for functions such as ON, OFF and an LED as the function indicator. When the alarm is in OFF state, then it carries no real operation (just turns off the function indicator), and when in ON state, then it turns on the function indicator and examines whether there is sufficient ambient light (via the light sensor) to produces a musical tune with piezo speaker. This process is repeated continuously if there is sufficient light until the button OFF is pressed. Arduino: Digital Indicator of Alcohol Content. This project refers to an Arduino sketch that implements the logic of a digital indicator of alcohol content. This system can be used as a device for breath test. There is the MQ-3 sensor in the system to detect alcohol. A suitable multi-LED bar graph (which is driven by a 8-bit shift register 74HC595) is used as an indicator rating the alcohol content. If the alcohol content is high, then a tune is produced through a suitable piezo speaker. Finally, there are two buttons in the system for functions such as ON, OFF and a LED which is the operation indicator.